My rather lovely handbag is from Dune via Very.co.uk. It's huge! I used it as a weekend bag last week and managed to cram a clutch bag, bottle of rum, heels, full outfit, pjs and toiletries in there. I've also been using it for work because I can fit my book and lunch in there instead of carrying them in a separate tote bag. I also love all the studs and buckle details and it the neutral colour leather makes a nice change for me because all my bags are plain black. Hope you all enjoy the snow that is forecast for tomorrow, I personally HATE snow because it means I'm stuck in the valleys and wont be able to go out for a dance boohoo. Also, if you're based in South Wales I would love to see your face at cdfblogs tonight. OMG...loving the bag... I am on Very tooo.. they do do some good things on there..my bill is quite big at the moment though...ooops! Love you so much, that face is amazing! I get a bit stir crazy too, I want to take photos outside! I blinking love the snow! I'm actually hoping for snow because we NEVER get any! 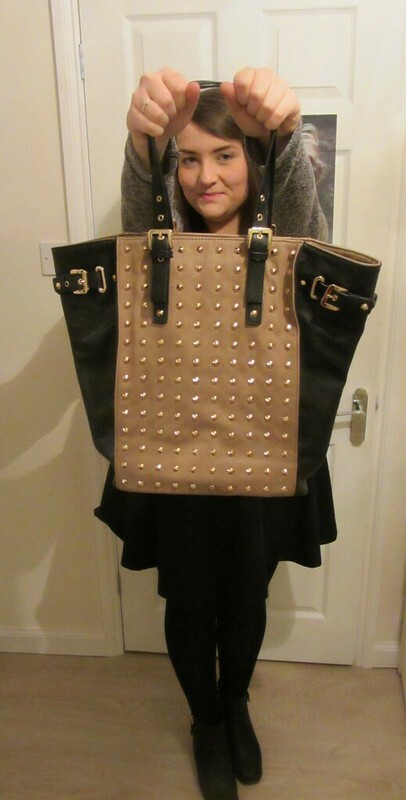 This bag is rather awesome and big enough to fit every possible girly essential. Such a cute outfit! Love that bag. I hate snow too, hope you weren't too affected. surfing around your blog posts. After all I'll be subscribing for your rss feed and I'm hoping you write again very soon!